Digital textbooks, virtual software delivery, and flexible learning environments support IU's mobile students and place the university among the leaders in IT for higher education. University Information Technology Services (UITS) encompasses units dedicated to support and services for the university community, as well as those dedicated to high performance computing, advanced networking, and evolving international cyberinfrastructure. For org charts, click on the red division and unit names below. 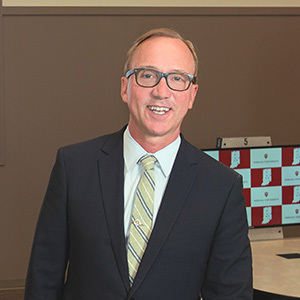 UITS reports to the Office of the Vice President for Information Technology (OVPIT), which drives the continued development of information technology at IU. Brad Wheeler, PhD, is vice president for information technology and chief information officer (CIO). For individual org charts, click on the red division and unit names below. The Finance Office (FO) provides financial management and support for all units within UITS. Comprehensive services include budgeting and associated guidance/oversight, financial analysis and reporting, payroll, accounts payable/capital assets, and accounts receivable. The UITS Human Resources Office works to develop strategies, programs, and services to ensure the availability of highly motivated, well-trained, and results-oriented technology support professionals. Information Security seeks to protect the confidentiality, integrity, and availability of data and delivery systems across the university. The User Experience Office (UXO) takes a holistic approach to create simple, inclusive digital experiences. The UXO collaborates with university partners to help apply principles and best practices to their projects.